A procedure is a program that can carry out certain tasks or return a value. It can be called from other procedures. 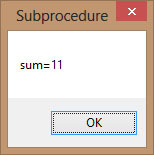 In VB 2015, there are two types of procedures; sub procedure and function. A sub procedure is a procedure that performs a specific task but does not return a value whilst a function is a procedure that returns a value. A sub procedure is usually used to accept input from the user, display information, print information, manipulate properties or perform some other tasks. It is a program code by itself and it is not an event procedure because it is not associated with a runtime procedure. It is called by other code whenever it is required to perform a certain task. The parameter is a certain data that is passed into the sub procedure to perform a specified task. In this example, we create a sub procedure, to sum up two values that are specified as the parameters. The main program can reference a procedure by using its name together with the parameters in the parentheses. 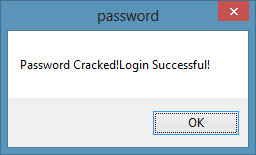 This is Visual Basic 2015 program that demonstrates how to crack passwords. It can generate possible passwords and compare each of them with the actual password; and if the generated password found to be equal to the actual password, login will be successful. 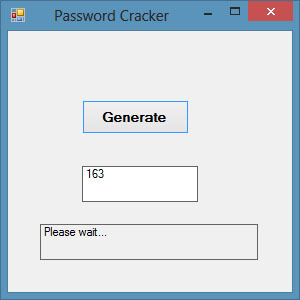 In this program, a timer is inserted into the form and it is used to do a repetitive job of generating the passwords.We create passwords generating procedure generate () and it is called by the Timer1_Tick() event so that the procedure is repeated after every interval. The interval of the timer can be set in its properties window. A value of 1 is 1 millisecond and a value of 1000 is 1 second. We shall set the Timer's interval at 100 which is equivalent to 0.1 seconds. The Timer1.Enabled property is set to false so that the program will only start generating the passwords after the user clicks on the Generate button. Rnd is a Visual Basic 2015 function that generates a random number between 0 and 1. Multiplying Rnd by 100 will produce a number between 0 and 100. Int is a Visual Basic 2015 function that returns an integer by ignoring the decimal part of that number. Therefore, Int(Rnd*100) will produce a number between 0 and 99, and the value of Int(Rnd*100)+100 will produce a number between 100 and 199.Finally, the program uses If…Then…Else to check whether the generated password is equal the actual password or not. If they are equal, the passwords generating process will be terminated by setting the Timer1.Enabled property to false.